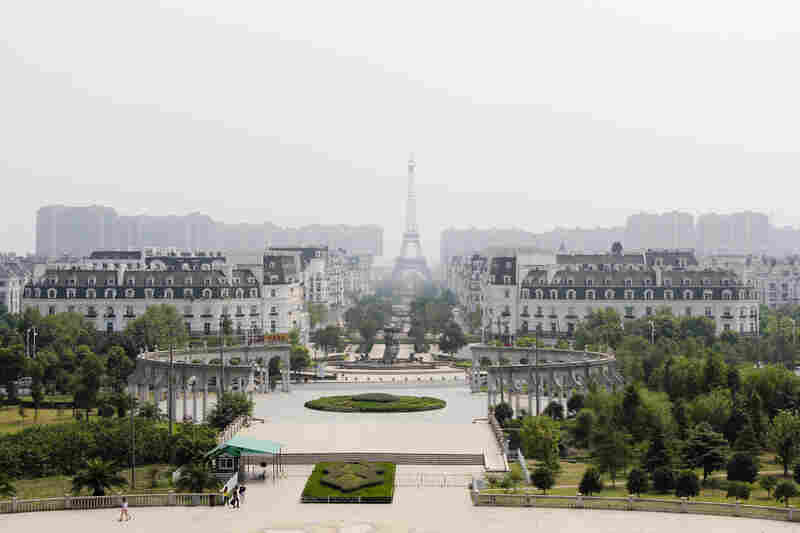 Visit Paris And Venice In The Same Afternoon (In China) : Parallels Chinese developers have been building communities that mimic European cities, believing they'll be a big draw for the country's newly wealthy. But so far, the appetite for the homes has been modest. 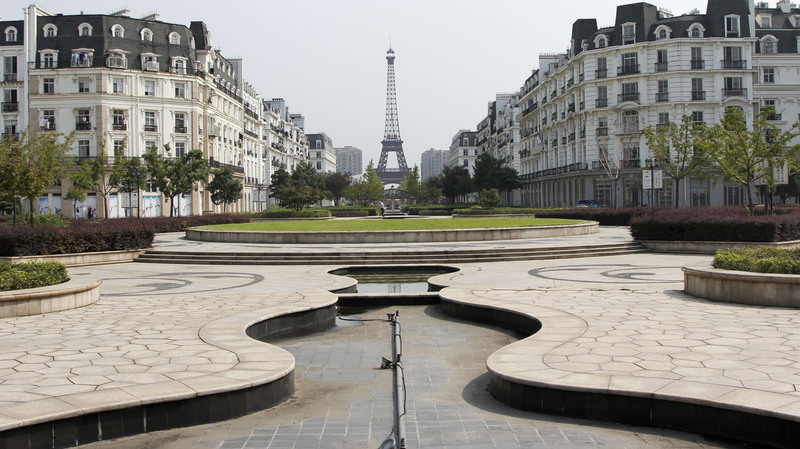 Sky City, a replica of Paris, is a 40-minute drive from Hangzhou in China's Zhejiang province. The rich people developers hoped would move here never materialized. Among Sky City's more surreal aspects are fake storefronts that house nonexistent businesses. A fake menu outside a fake restaurant in Sky City. A replica of the Fountain of Apollo, which is actually in Versailles, is one of the many sculptural features in Sky City. A girl and her mother catch fish in a pool of water near Sky City's signature structure: a 300-foot-plus Eiffel Tower. Want to visit Paris and Venice in the same afternoon? You can, if you're in China. Chinese developers have for years built residential communities that mimic famous European cities and towns. They are the subject of a new book, Original Copies: Architectural Mimicry in Contemporary China. One of the most striking examples is Sky City in coastal Zhejiang province. It looks just like Paris, down to the Mansard roofs, the narrow chimneys (they're fake) and balconies. 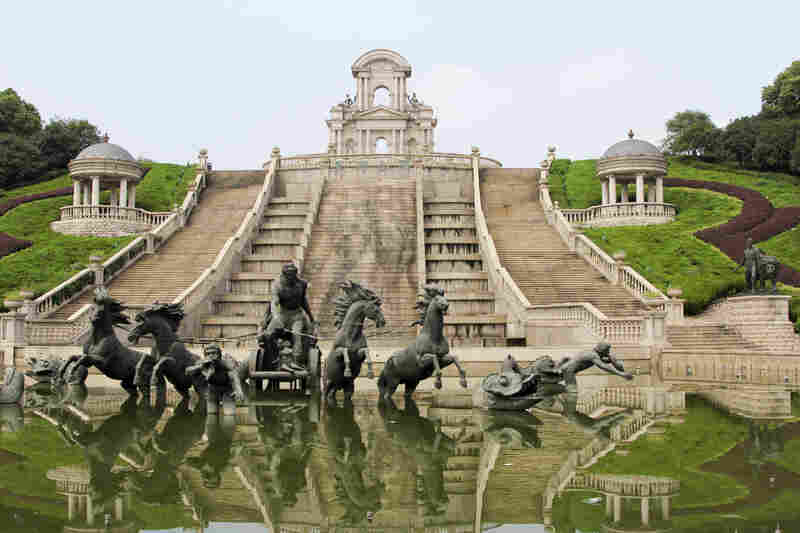 Sculpted horses leap from a replica of the Fountain of Apollo, which is actually in Versailles. Anchoring this faux City of Lights is an Eiffel Tower that rises more than 300 feet out of a field of tall grass and marsh. "It's very special because all the architecture is in the European style, not like average Chinese residential complexes," says Xie Tingjian, who runs a business that sells clothing on the Internet. Dry fountains along Sky City's main thoroughfare, called the Champs-Elysses. His office overlooks trees, lampposts and dry fountains along the main thoroughfare, called the Champs-Elysees. "It's very beautiful." he says. Sky City was built in 2006, but there still aren't many people here. A big reason is the location. It's a 40-minute drive from downtown Hangzhou, the nearest big city. Most of the development's first-floor shops are still empty after seven years, and the community has a rundown, creepy feel. There are fake storefronts for a nonexistent coffee shop and an advertising office. 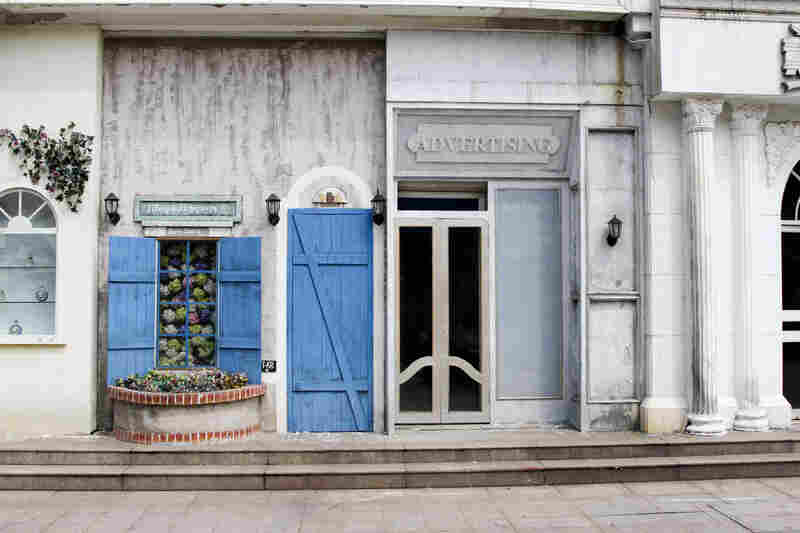 The sign in front of the advertising office reads: "Advertising desing (sic) is visual communication art and desing (sic) it value ..."
There's even a truck that drives around the Eiffel Tower spraying water on the road and playing "It's a Small World After All." What were the developers thinking? When NPR asked to speak with them, we were told they were busy in meetings, which is Chinese for: "I don't want to talk to you." Yan Xuanren, a senior agent at a local Century 21 office, says the development isn't the ghost town it seems and most of the apartments are occupied. 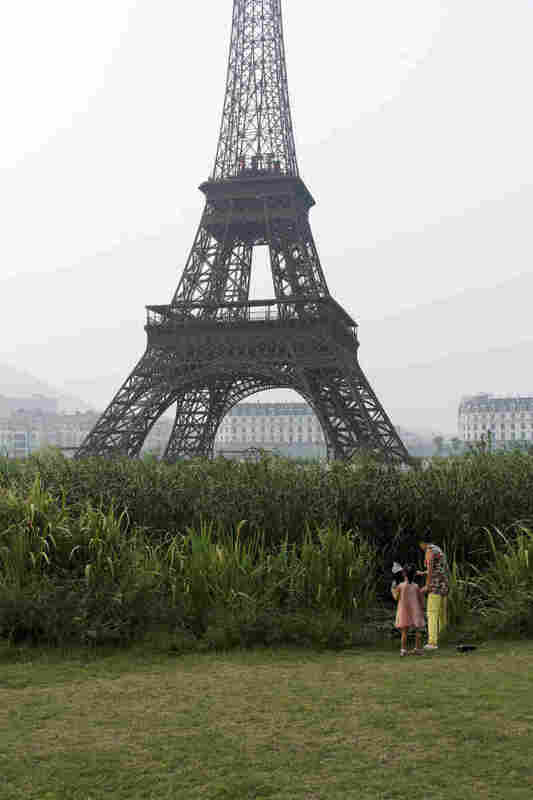 "The original plan was very good, building this into a residential area, and when people started flowing here, building a commercial district," says Yan, whose office looks out at the copy of the Eiffel Tower. "The developers thought a subway line was coming to the front of the complex." But the subway never materialized and neither did the rich people developers expected. Most of the villas — some priced at more than $800,000 — still sit empty. "As an architect, I feel it's very strange," Tong Ming, a professor of urban planning at Tongji University in Shanghai, says of the replica communities. "For our profession, it's really shameful to copy something from somewhere else." Tong says developers began building copy communities as China's cities and home ownership took off with the country's economic boom. They didn't know what consumers wanted and figured copying famous landmarks and urban landscapes might lure people to suburban developments. Of course, there is a long history of borrowing in architecture. Consider all those Corinthian columns on the U.S. Capitol in Washington, D.C.
Tong says the problem with China's copy communities is they're just knock-offs, there's no innovation. Bianca Bosker, whose book Original Copies came out earlier this year, has visited many copy communities and spoken to residents. She says some see higher-end developments as a way to show off their new wealth and taste. "They're selling not only this Western knock-off home, but they're also selling the dream of a better life," Bosker says. "There's a sense that you can be a bureaucrat, you can be an entrepreneur and you can live like a king." As recently as the 1990s, most urban Chinese didn't even own their homes. The government assigned them musty, Communist work-unit apartments. Today's copy communities are light-years from those days. "A lot of people dismiss them. They think they are ugly, they think they are tacky," Bosker says. "But I think that what these communities are testament to is the incredible amount of personal choice that Chinese consumers have." About an hour's drive from fake Paris, about a dozen retired women are dancing outside after dark to a 1990s dance club hit "Moving On Up." This isn't unusual. In China, retired women dance all the time for exercise. The difference? This group is line dancing along the edge of a huge replica of St. Mark's Square in Venice. This is "Venice Water Town," another copycat community filled with Italian-style villas with balconies and ochre-colored walls. The dance leader, who introduces herself as Teacher Xie, came here for the clean air and the Western architecture, which she associates with sophistication. "When I was working as a teacher, I thought Western teaching methods were more advanced," Xie says. So, she bought a Western-style home and filled it with European furniture and oil paintings. This fake Venice, which is near a subway stop, is much more successful than Sky City, the fake Paris. In the evenings, people sit on park benches overlooking the canals and chat by the light of street lamps. BMWs, Porches and Volvos line the road. There are surreal touches. Part of St. Mark's Square has been turned into a basketball court and the Doge's Palace doubles as a dorm for workers at a nearby amusement park. 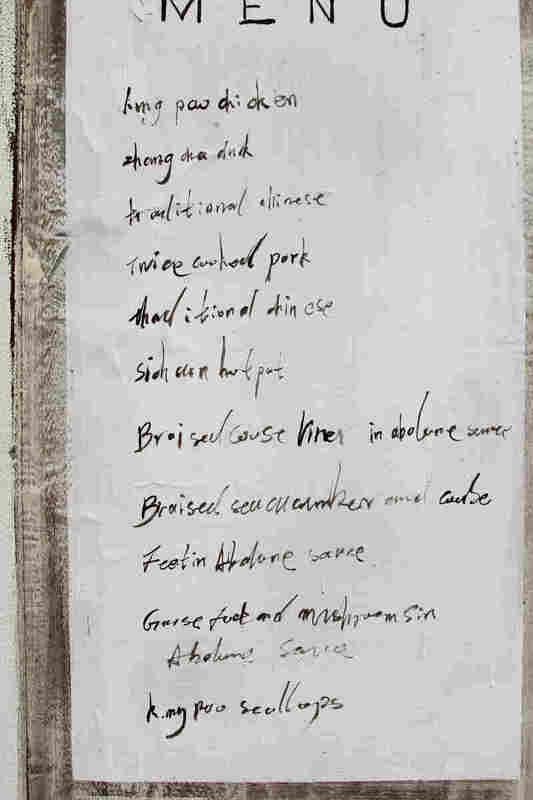 None of this seems to bother the locals. Liu Shengdi, one of the dancers, recalls the first time she saw Venice Water Town. "Wow! I said this complex is too beautiful," says Liu, a big bear of a woman. "It totally looks like a painting! How were they able to design such beautiful houses?" Ming, the urban planning professor, thinks copycat communities may be just a phase, a byproduct of China's breakneck urban growth. He says as more Chinese travel abroad, the novelty of foreign architecture is wearing off and he hopes, in the future, developers will come up with more original ideas.